Revisioning Point held their second public idea exchange event on Thursday June 25th at the Stevens Point Area Convention Center & Visitors Bureau on the north end of Division Street. There were two presenters (sharing information about the high cost of free parking, and the sometimes strained relationships between “town and gown” in university communities) followed by a walking tour of Division past Trig’s to Maria Drive. Despite rain earlier in the evening, the weather was perfect for the event and over 40 community members attended, including Representative Katrina Shankland, several city council members and Mayor Mike Wiza. As we wrapped up the tour, we discussed how the two presentations on parking and community relationships may have seemed disconnected from the walking tour of Division Street and potential for improved infrastructure and landscaping on this highly trafficked northern gateway to Stevens Point. This post is meant to help connect the dots between what can seem to be distinct issues by focusing on the tax increment finance (TIF) district and how money relates to development, parking, and UW Stevens Point. Trevor Roark gave the evening’s first presentation on “The High Cost of Free Parking”. Trevor is a bicycle commuter who sits on a UWSP Parking Advisory Board. He pointed out that free parking is never actually free, since someone has to cover the costs of building and maintaining parking lots and streets. Even paid parking is often heavily subsidized. He noted that it is costing about $1 million to add 75 new paid campus parking stalls next to the fire station, which amounts to over $13,000 per spot. Assuming no maintenance costs, the annual parking sticker revenue on campus would not recoup that cost for 100 years. In addition, parking lots generate unpriced costs, or “externalities”, that everyone in the community pays whether they park or not. For example, many historic homes and buildings in Stevens Point have been torn down solely to make room for more free or cheap parking. The city’s overall sense of place is lost forever for the sake of convenience. Sara Raikowski, a Point native who operates the Market on Strongs, discussed how the UWSP campus can sometimes feel disconnected from the rest of Stevens Point. Growing up, Sara’s family often knew to avoid the campus when running errands around town lest they get stuck in a traffic backup or stalled at a crosswalk while students are trudging to class. Sara shared a map showing how the design of the campus has historically kept it apart from the city, noting that the parking lot on Isadore Street, parallel to Division, is physically bound off from the businesses on Division by a fence. This sense of separation is part of what makes “town-gown” relationships difficult to develop; the residents of the community sense that they are not really welcome on campus, and by avoiding campus altogether there are rarely opportunities for shared experiences. Following these talks, the attendees were able to take a walk up Division Street and see for themselves the relationship between parking, urban design, and the potential to better relate the UWSP campus with the community. Tori Jennings shared her photoshopped version of what Division Street could be if we were to plant more trees, accommodate bicycles, and require buildings to be built closer the street with parking in back. Tori’s exercise in visioning a possible future helped set the tone for the tour, as people were invited to look more critically at how the design of sidewalks, streets, and blocks affects how we experience this northern gateway to Point. For example, the wide streets and absence of curbs along the stretch near Culver’s is very similar to a rural highway, and it isn’t surprising that few drivers feel the need to follow the posted speed limits. This area hosts a large number of hotels, but there is no easy way for visitors to get from hotels to the grocery store or restaurant on the west side of Division. North of Maria, the sidewalk benefits from a number of pleasant shade trees, but south from Maria (where more people actually walk) the sidewalk is a harsh, unprotected gauntlet. As we walked back to the Convention and Visitor Bureau, an astute participant pointed out that the three parts of the meeting – parking, town-gown, and Division Street – seemed pretty disparate. What connects these dots? This is where the northside TIF comes in. Tax Increment Finance districts provide a financial resource to cities that allow them to invest in new streetscape and other infrastructure to encourage additional private development and investment that might otherwise not occur. Cities can also use TIF funds to directly subsidize private development, often through property tax reductions. This financial subsidy is often requested by developers because they need to show a strong likelihood of profit in order to secure bank financing for commercial and residential projects. Residential investments like apartment buildings are challenging to finance because they often entail a two or three decade payback period in order to recover the money spent on construction and land acquisition. Banks and investors have no guarantee of market conditions over that long timeframe and could easily wind up losing a lot of money if the economy slows and demand drops off. Relieving the investor’s obligation to pay some or all of their property taxes greatly increases the odds that a project will stay out of the red. But financial subsidy is not the only tool available to the city. Most TIF projects actually focus on infrastructure and revitalized urban design, since new streets and an attractive community can also boost demand in an area and thereby make private investment a safer bet. Another “tool” at the city’s disposal is to be more flexible with the design restrictions that their regulations impose on developers. In some places, this can be as straightforward as allowing a developer to add additional stories to an apartment building, creating more rentable units with improved views. More pertinent to this discussion, the city can vary the number of parking spaces required for residential and commercial projects. By not demanding a high number of parking spaces, developers can purchase a smaller amount of land for a given project, or dedicate more of the land to a profitable use, both of which will improve the financial prospectus of their project. So here’s the thread that connects the dots: the city and the campus have a number of opportunities to improve the spatial and design relationship in the Division Street corridor. Private student housing can both be a part of the future redevelopment of the area and can help fund the public improvements, but such private investment will likely require some flexibility with respect to parking requirements. We, as a community, should be inclined to provide this flexibility because the student renters, like those living in the UWSP residence halls, are not as dependent on automobiles and parking compared to the community as a whole. Plus, we really should be sorting out ways to adjust our collective expectation of “free” parking in the community, and we will never get to that if we keep insisting on more and more new parking areas. This is not pie in the sky philosophising- the most recent student apartment proposal on Division Street was killed over the parking requirements. In other campus areas like Madison, Oshkosh, and La Crosse, new residential projects are moving forward and the taxes they pay are being used to make their neighborhoods more livable and walkable. 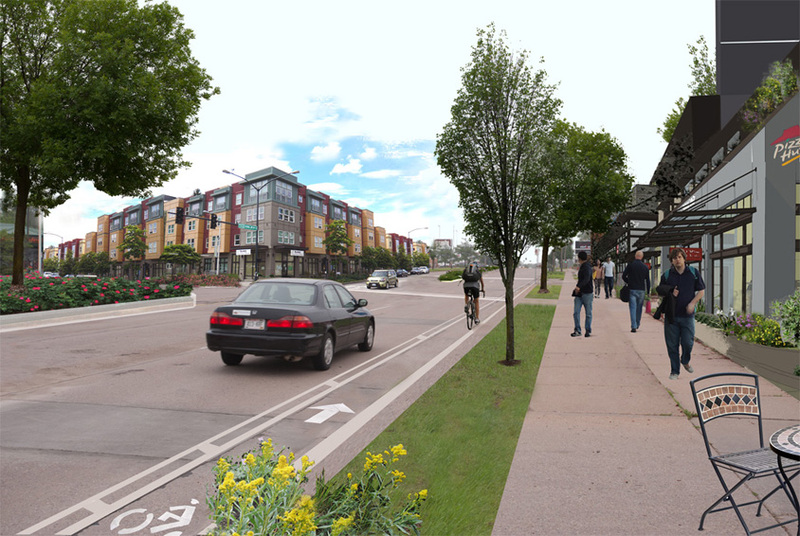 Let’s set the stage for a similar revitalization of Division Street in Stevens Point. Eric, thank you for insightfully bringing together the various threads of this session. Your cogent writing and knowledge of sustainable planning and design is much appreciated. We are fortunate to have you in our community.